As some of you may know, my favorite favorite star to bring up when discussing binaries is Tau Boo B (Go ahead, say it out loud. Giggle. Join me in the giggling. Wasn’t that fun?). This little red dwarf star is the companion star to the much more famous, but no where near as fun to say, bigger Tau Boo A. Tau Boo A is a solar (sorta) twin, with similar temps (it’s a bit hotter) and a similar mass (its a bit bigger) to the Sun. Now, we have one new characteristic to add to the list of similarities. Astronomers using the awkwardly names Canada-France-Hawaii Telescope atop Mauna Kea have observed the flip of Tau Boo A’s magnetic field. Here’s how that works. As far as we understand it, stellar magnetic fields are created in or near the boundary layer between the part of the star that transfers energy via radiative transfer (like heat transferring up a pot handle) and the part that transfers it via convection (like a lava lamp). In this boundary zone are ionized (charged) particles. As they rotate around the star like so many particles flowing through so many circular wires, their motion generates magnetic fields. Since the inside of the star doesn’t rotate like a solid, all these moving, magnet making charged particles can have a myriad of interactions that lead to all sorts of magnetic behavior (and misbehavior). It is possible that the gravitational pull of the planet Tau Boo b (lower case is the planet), on Tau Boo A tugs that layer of the star, carrying it around faster and faster, and possibly accelerating the process that leads to the magnetic pole flip. 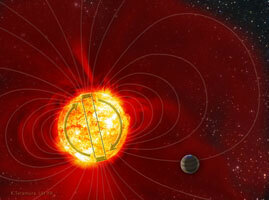 That said, magnetic fields are very very hard to understand. Lots of modeling needs to be done. And even if the models show that the planet should accelerate the field flip, the result won’t be fully trusted until we observationally see the flip happen a few more times. Astronomers will be watching to see what happens. They have some hope – if the planet had a 11ish year cycle between half flip (north goes to south), we would have had a less than 1 in 5 ish chance of seeing the flip in the past 2 years of looking. The fact that we saw it is just enough improbable that it hints (and I won’t saw more than hints) that the cycle is maybe shorter. It’s just kind of cool to imagine a planet twisting up a star. So Tau Boo A and Tau Boo B are the stars and Tau Boo b is the planet that orbits TBA? I’m a little confused on that. Tau Boo b is a planet orbiting Tau Boo A (technically, it probably should be Tau Boo A b, But I don’t think I’ve ever seen it written that way). Very cool. Kinda twists you all up in knots to think about it. I was looking at Tau Boo A and B in orbit on the program Celestia. They appear to have orbits that cross each other and also are on the same plane. But what I see that is weird is that they appear to be orbiting two diffent hidden stars. And when in close range they excellerate each other yet never collide. I upped the speed on Celestia and it amazes me. Is this accuarate? Do they really do that? And if so, what are they orbiting? Weird. Hi Robert – The two stars are orbiting the center of mass of the two stars (which is basically invisible), and the two stars always keep that point between them, preventing collision. How recently did it happen and were there any biogenics involved.